Got it. I was too tired to see the DL on the glass8 page. @Gatharian, I'm starting to believe that if you spent half the time learning how to edit a theme atlas that you are spending asking over and over for a one pixel fix you'd have fixed it yourself by now. At this point you've wasted everyone's time by reading through so many copies of the same post that you owe to all of us to make the fix and post the result. C'mon, you're capable of adding a balloon window with a drop shadow to an image. You're clearly no stranger to image editing. This is how you get things for yourself that satisfy your desires. What image editor are you using? Does it represent transparency? Can you figure out which are the button fills when you open the Theme Atlas? What happens when you delete a row of pixels from the top of each (making them transparent)? Does anyone else experience problems setting opacity/color balance on glass/inactive frames? Using 10Entx64TH2, ran as admin (current user settings). Yes. I don't believe there's any separate control of the inactive frames any more. That's Microsoft's doing, as far as I know. and for the Aero Custom Theme I use, things got better with TH2 since the TOP bar now has a different color for inactive and active which was a bit weirder in w10 rtm. You can use AccentFrameInactive settings for inactive frame color in TH2. However, I just discovered bug which precent Aero Glass from apply custom colors. 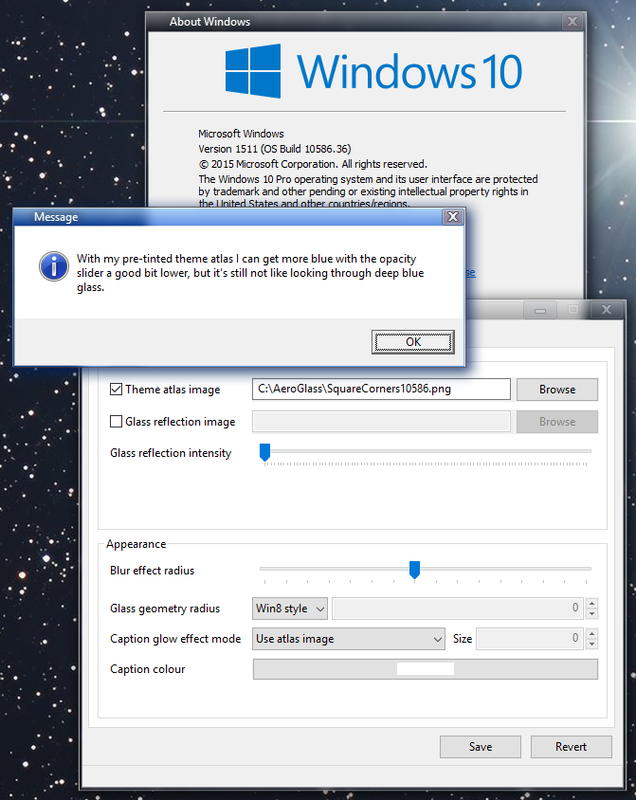 Let us know when we can test a new Aero Glass GUI tool. I'll be happy to give it a test. Seems to me there's a real problem with the current set of software getting enough color in the borders, which is why I've created theme atlas graphics with pre-tinted borders for active windows. Is there something more that can be done about it? I have no problem with colors. Check this site for classic personalization menu on desktop right click. I can make borders any color I want with ease. 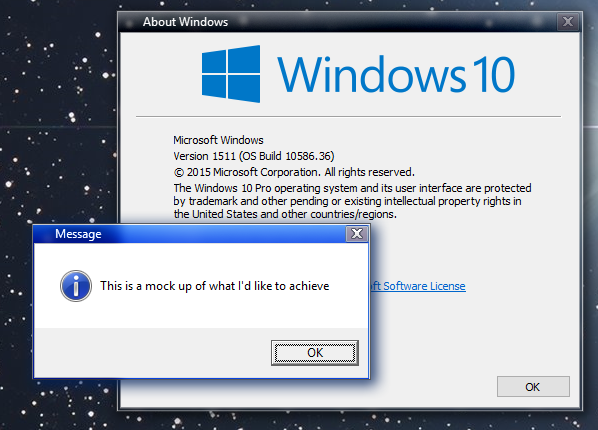 It works with all Windows 10 builds I have tried it on. I'm not talking about the flat window border color the toddlers at Microsoft are proud of implementing. I'll look over that link - thanks. 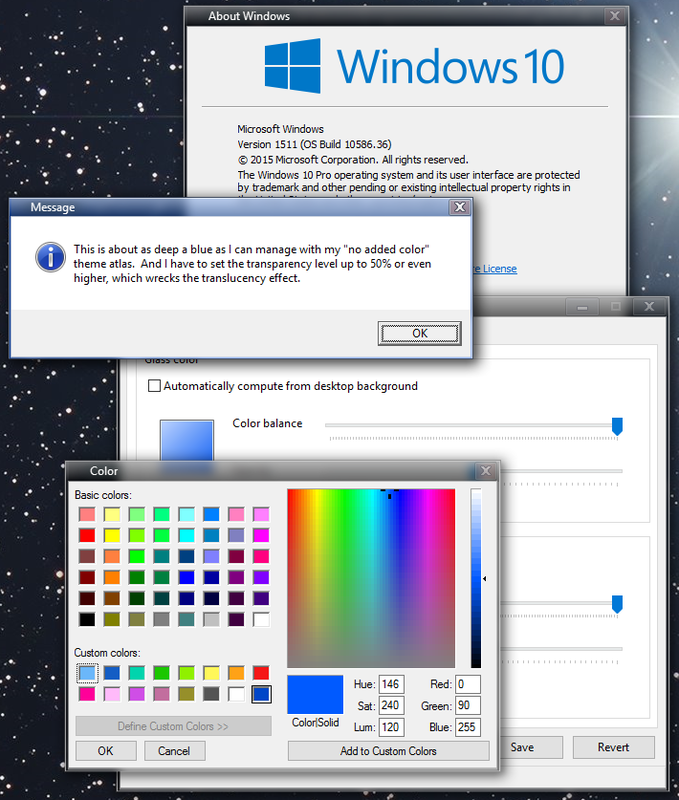 I'd like my active windows WITH Aero Glass and high translucency to look deeply colored by comparison to inactive windows. Like looking through deep cobalt glass - clear, but very, very blue. It's not been possible to colorize an active window border deeply for quite a while now. If you've achieved it, please share an image. I can certainly miss things right in front of my face. I can get that deep blue you like for all frames, but the inactive frames stay the same color as the active frames. Actually I like that behavior, but It should be capable of adjustment. No problems with my custom Rs1 themes getting deep blue, inactive frames get colored perfectly as well. Hm, I'll need to look at what's in my theme atlas again. Perhaps I've overdoing the "light from the top" look. Thanks for the info and sample, dhjohns and MrGRiM. 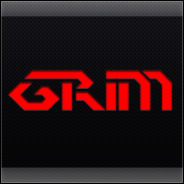 MrGRiM, what's your transparency setting in the above example? I deleted all of the settings for aero glass, the settings are all taken from the custom theme and from what you see in my screen. Here is another one I just did, tried to use your Atlas and screen shot to make a similar style.